A week of the Bosque del Apache National Wildlife Refuge Bird Photography Workshop condensed it into a one-day video. 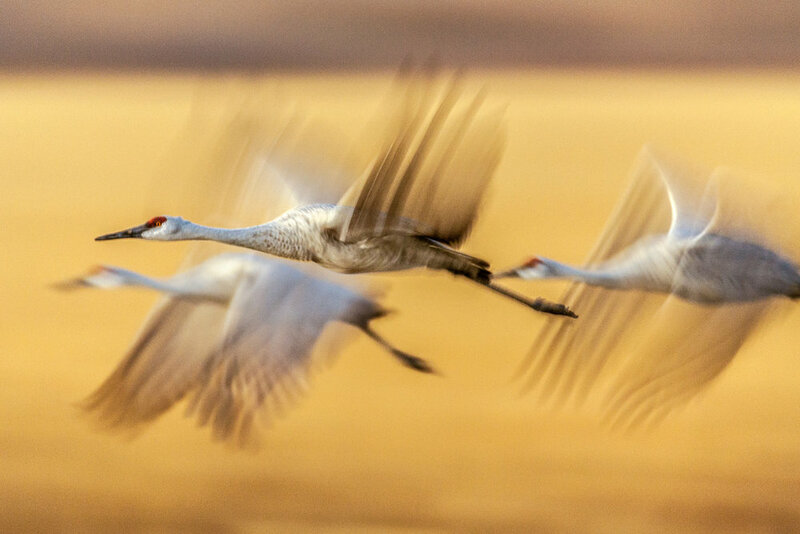 A Day At Bosque del Apache is meant to give you a taste of the bird life, the fantastic light, and the possibilities that exist there for being creative. As dawn rises above the distant mountains and the sky brightens, the sound of geese and cranes begins to fill the sky. There is simply no other place like Bosque. It's like the Grand Canyon, you have to see it, experience it, to believe it. The light in New Mexico is everything and more than Georgia O'Keeffe painted and showed the world. For a birder or a bird photographer this place, at this time of year, is mecca. The birds are close, they fly by all morning and evening long, and the light is just plain wonderful. In this four and a half day workshop, you will experience the best Bosque has to offer. We will arrive before dawn each day and experience the Snow and Ross's geese blasting off as they go to the cornfields for the day. We'll spend each morning photographing geese and cranes, then take a break in the middle of the day and return for the cranes and sunset. Four and a half days of photography, nine shooting sessions, four mornings and five afternoon/evenings. The workshops will begin in the afternoon of December 9th and ends on December 13th, 2019 after sunset & dinner., with departures for home on the 14th of December. This workshop is scheduled for the second week of December to avoid the large groups and crowds that congregate in late November, we'll be able to move around more and get in better positions for the best shots. Don't get lost in a big crowded workshop, this one is limited to 6 participants, you'll learn more, and photograph more birds. Snow & Ross's Geese balsting off with a roar. Sandhill Crane "parachuting" into the evening roosting ponds. Reserve your spot in the workshop with a $500 deposit. Lodging, meals, and ground transportation during the workshop are not included in the workshop fee, (although we will carpool during the workshop). The typical workshop day has a morning and afternoon shooting session with a mid-day break. After we receive your registration, we'll send you a detailed information packet about your workshop, including what to bring, more specific details on the course structure, hotel rendezvous information, etc. We recommend you purchase travel insurance and will provide you contact information. Check the Terms & Conditions in the footer for the workshop cancellation policy.